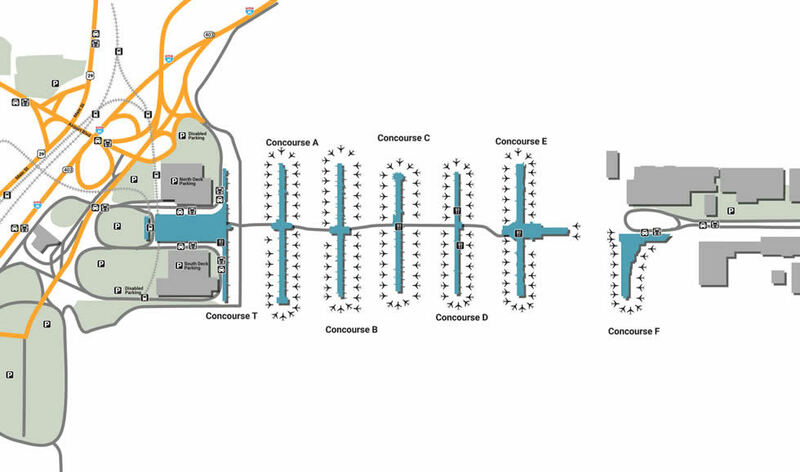 The Atlanta Hartsfield-Jackson International Airport is a very large airport so getting to the various restaurants, parking and transportation can be confusing. You can use our maps to assist you along the way during your visit. Whether you’re arriving to or leaving Atlanta, make sure every moment is a relaxed one by keeping track of where to go while enjoying what’s around you. Typically seen as stops worth leaving, a lot of air facilities don’t take the time to make visitors feel welcome, but Hartsfield-Jackson International does the opposite. With the knowledge that every visitor is a common guest, one that will always be there, a welcome mat is almost mandatory when you show up to southern hospitality’s doorstep. The process of parking can be a stressful one, but it doesn’t have to be. This is especially true for ParkATL, which provides five separate lots for domestic travelers as well as two for international flights. For domestic travelers, stay on Airport Blvd from the direction of I-85 South, keeping in mind the daily/hourly lots at Terminal North, West Economy, and Terminal South. At the end of the road, you’ll see a Park-Ride lot to your right, which is mostly used for public transportation. If you’re leaving the country for quite some time, consider long-term international parking, located at the end of M H Jackson Blvd. With over 70 guest-service reps available at different parts of the airport, you’ll not only have a whole team helping you out, but the chance to resolve any problems as quickly as it occurred. If you’re in need of ground transportation, there’s 24-hour center at the Northwest Atrium right beside the Information Desk. For businessman on the go, get a shoe shine as you wait for your ride, visiting one of the many including the ones outside of gate A20 and B17. The facility is busier than most airports, which is exactly why it has over a dozen smoking lounges set in place to relax the guests – visit one of many, whether it be the first one outside of gate A3, B7, and C39, or along the F Mezzanine. If you find yourself stuck at Hartsfield-Jackson due to a layover, don’t stress out – kill some time by enjoying the many retail shops, whether it be the best-selling books and international newspaper choices at ATL Today or the innovative gadgets at the Amazon Kindle Zoomshop. The airport is also home to a Coach store located at F Centerpoint, offering high-end handbags and a large range of choices, which tends to catch women of excellent taste off-guard in between flights. One of the best parts of life is that when there’s nothing to do, there’s always food, and this is especially true for the Atlanta Airport. Grab a tasty pretzel at Aunt Annie’s, located outside of gate D23, and enjoy your salty snack while you wait for your flight. If you’re more in the mood for a full-on meal, enjoy fresh Italian at Carrabba’s Grill, located in the C Centerpoint. For a more casual experience, drink some tea or a warm cup of coffee at one of the many cafes scattered across the facility, one of the tastiest being Café Intermezzo, located within the B Centerpoint food court.